Innovation is fundamental for pharmaceutical companies involved in research and development activities. Our mission is to bring natural active principles into the service of mankind by isolating them using the best, safest technology presently available and putting them onto the pharmaceutical market. We believe that basic, ongoing research in close collaboration with the world of pure science plays a central role. Identifying innovative drugs of high therapeutic value is a top priority for Opocrin. Opocrin S.p.A founder and well-recognized as mucopolysaccharide specialist by International Scientific Community. 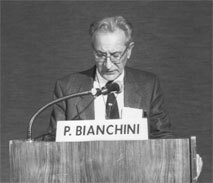 Opocrin President and R&D Director till 2007, Pietro Bianchini held several tasks in the Italian and European Pharmacopoeia redaction. He significantly contributed to the studies on low molecular weight heparin, by publications on the most important scientific journals. His family still nowadays represents the majority shareholder of the Company and, since 2008, Opocrin research laboratories have been entitled to him.